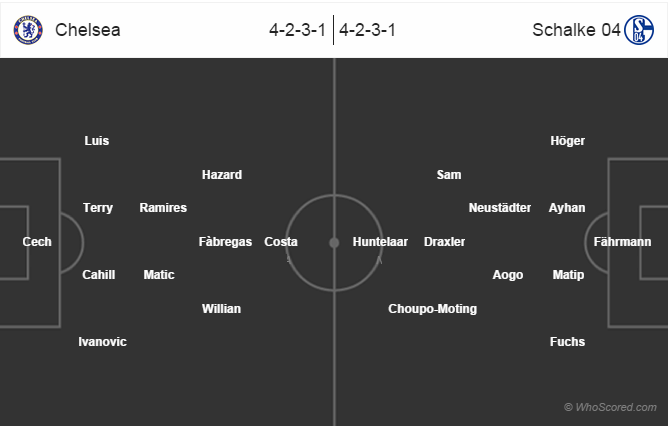 Possible Lineups: Chelsea vs Schalke 04: Chelsea are going to open their new Champions League campaign against the Bundesliga side Schalke 04 tonight. Chelsea are going to open their new Champions League campaign against the Bundesliga side Schalke 04 at Stamford Bridge tonight. Chelsea are unbeaten this season. Schalke have never managed to beat Chelsea in the Champions League. Schalke have not won a game this season. Didier Drogba who returned to Chelsea this summer is the only player doubtful for the game, the rest squad is fully fit to play. For the German side Benedikt Höwedes, Fabian Giefer, Sead Kolasinac, Leon Goretzka, Jan Kirchhoff and Jefferson Farfán are set to miss this clash with their respective injuries while Joel Matip is a doubt for this clash. Chelsea 2 – 1 Schalke 04, a difficult game for the home side.